Apply finish to hardwood before grouting ceramic tile that's touching it. This prevents the grout turning the hardwood black. With oak flooring, don't use a nail set. Use a large slotted screwdriver instead, aligned with the grain. These marks, when filled in, will blend better with the grain than a round hole from a nail set. Make the plinth block at least as wide as the transition strip. This block can be as fancy or as plain as you like, on the top, but the sides are square. It is thicker than your base molding so that the base can go into it at the two levels. The finished flooring goes on first; the plinth on next; the base next and the transition to the plinth, last. 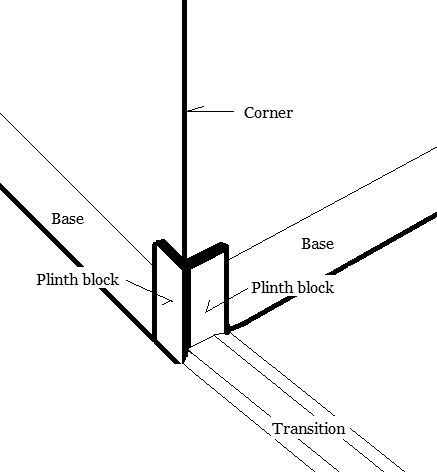 Yes, the plinth block was quite common in the old houses, used as a transition from base to door casing. I still see this on new homes with the classic theme. Yes, getting an inside measure is not accurate with bending the tape around. I do two things - most times when I want to measure accurately from one inside A to inside B, I measure from A and mark a foot mark near inside B, then go to the B and measure back to my mark and add the two measurements together. I prefer this method. The other way is to measure from A to B by extending the measuring tape so that the back side of the case is tight to the inside of B and read the measurement where the tape goes into the case. On most tape cases there will be a measurement to add 3" or so which is the width of the case. Try these two ways and see which one you prefer. When working on a cabinet, for example, you need very accurate, tight joints for shelf edging or facing. I then take the piece and mark it for length, in place, not using a measuring tape, at all. I would lift the offending tiles. You could probably use the chipped one along a wall or where a narrower tile was required. Grout won't cover a chip like that. Hi Dave, I just breezed through the list of "how to" topics on the web site. I saw a few I need to circle back to, but not exactly what I was looking for unless I decide to build a door. Just noticed my front door does not clear the new floor. I've been cutting back wood trim as a matter of course as the floor proceeds down hallways past closets, bedroom and bathroom entrances. However, this is something different - steel (or whatever they make metal doors out of). I have a Skill circular saw but have never cut metal with it. I've got a Saw's all with metal cutting blades but that thing is not too accurate. I've used Milwaukee's metal cutting saw - it works well and is a possibility. Thought I'd see what you had in mind. These doors are steel, alright. Usually, they have a U-shaped door sweep on the bottom of them, which contacts the wood part of an aluminum threshold. You usually, allow 1/2" for the sweep. If this is the case, you could get a 7" aluminum oxide blade for cutting steel that fits on a circular saw. The trick is to just set the blade below the steel, because it won't cut the wood between the steel surfaces. Cut the steel out all around and finish the cut with a wood blade. The U-shaped sweep will cover the cut. I have a deck that is 20 ft wide ( measurement is the one running along house )and 12 feet in length (measurement is going from house ) . 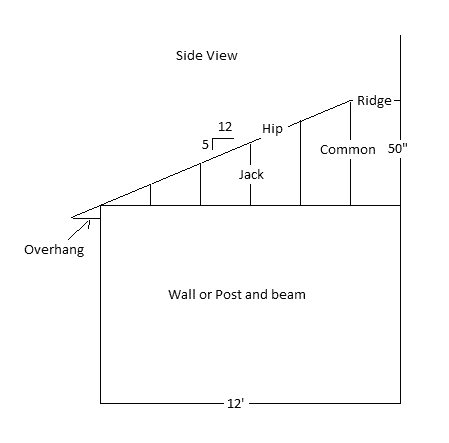 Can I build a hip roof over this deck ? If so can you get me plans . Yes, a modified hip roof will work. Since the width from the house is 12', the length should be 24' or greater. We can modify it so that we come out 2' from the house with a ridge then start the hip roof at 10' wide. With home remodeling, home improvement or home repair, it is always nice to get some ideas. Good home improvement ideas can come from magazines, TV programs and the Internet. Here are a few different home improvement ideas that may be of interest to you. I got these when I built my house. Here is a picture of a window dressing my wife did. She did all the 'toppers' herself. In some instances she used bed sheet material instead of curtain fabric, which kept the cost way down. On the larger, living room windows, she lined them. I'll ask her to answer your questions on them if you have any. This picture is primarily for you to look at as one option of making a window sill. The sill extends out from the wall about 3/4" and is accented with a piece of casing upside down with it's ends cut at 30°. We have had a lot of comments on our window seat. My wife got the same material from the store where we bought our furniture and covered the window seat and fronts with material to match as well as making cushions for the top. This is a good idea for useful storage. I designed this mantle piece from a picture in a magazine. Give me your dimensions of your fireplace opening and I'll give you a price on designing one for you to make. Send along your own picture and I'll design a mantle piece unique to your home, just give me your specs, i.e. 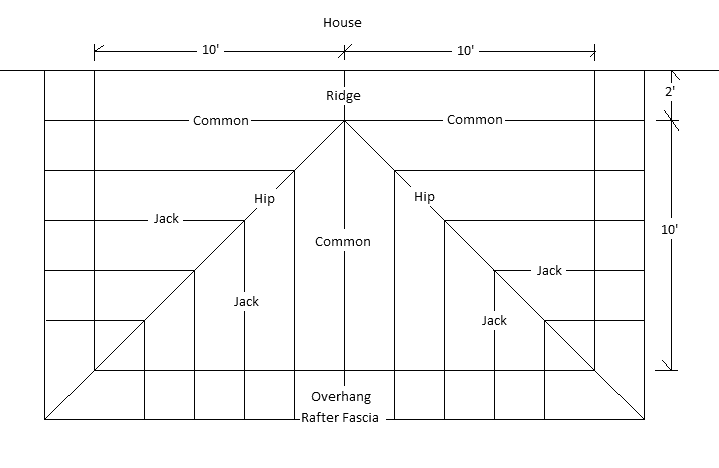 wood preferences, color of stain or paint, heights, etc. Here is my home improvement idea of bordering a ceramic tile hearth with strips of hardwood left over after installation of the hardwood floor. If you decide to do this it is very important to have the hardwood down first with the finish applied. This prevents the grout from the tile from turning the hardwood black. Hardwood stairs make a nice home improvement feature in a house. Put the hardwood stair risers on first, then place the hardwood stair nosing in position. Scribe a line along the inside of the stair nosing. Remove the stair nosing and layout the pieces of hardwood that come to that inside stair nosing line by ripping the first piece that's against the stair riser, to the correct width. The stair risers can be cut out of plywood 1/4" to 1/2" thick, usually. The stairs should be framed in beforehand with 5/8" minimum plywood, as used for the sub-floor. The hardwood is attached to this plywood by nailing through the spline and face nailing at the back of the stair riser. The hardwood stair nosing is face nailed and glued securely. TIP: When installing oak flooring, don't use a nail set to set the face nails. Use a slotted screw driver instead, aligned with the grain. These marks, when filled in, will blend better with the oak grain than a round hole from a nail set. Notice the detail of these home improvement pictures for an oak handrail support ending at the newel post. These stair parts are available from home improvement finishing stores and are glued and screwed together. The stair parts are made from oak hardwood, for staining or clear finish, and hemlock, for painting, with hemlock being quite a lot less in price. A curved hardwood handrail is not that difficult to make. The base and handrail are made up of... Read more at Remodeling 3: Home Improvement Ideas. We BUILD CONFIDENCE. If you need advice on your projects at work or home, become a member of our website, then send me a question via email.